When you think ‘Hyundai‘, what’s the first model that comes to mind? An i30? Accent? Elantra? I bet it wasn’t Genesis. Hyundai are best known for making affordable small cars, that’s why it’s somewhat surprising to see them branch out into the world of the premium large car. For the uninitiated, at first glance the Hyundai Genesis can easily be mistaken for a Lexus, Audi, BMW or even a Mercedes-Benz. At just shy of 5.0 metres long – 250mm longer than the mid-size i40 – the South Korean car maker has done a brilliant job of blending size with high-quality European-type styling. Jumping in, I press the engine start/stop button and a lot of things happen all at once. The car says “hello” to me with the help of a short welcome tune. Being a good country girl, obviously, I say hello back. The 16-way adjustable driver’s seat automatically moves forward, as does the ‘premium’ steering wheel – it’s as if the Genesis is attempting to give me a hug. The huge 9.2-inch central touchscreen lights up, displaying not only reversing cameras but also a top-down around-view camera. Apart from being quite cool to see in a Hyundai, the extra views make me feel more at ease – particularly when manoeuvring the car at low speeds – and ensure I won’t be caught out accidentally scratching the Coast Blue metallic paint. Most modern cars have some sort of warning sound to tell you when a door is open. And most are typically annoying because their tone and insistence often make it feel like they’re yelling at you, “CLOSE THE DOOR! CLOSE THE DOOR! CLOSE THE DOOR!” But in the Genesis, it’s different. In the Genesis, it tells you in a far more subtle way, more of a polite, “Excuse me. I would like to let you know that you have left your door open. Please kindly close it at your earliest convenience. Lots of love, your Genesis.” Conveniently, if you do just fail to close the door properly, the Genesis will actually do it for you thanks to its soft-closing power doors – very fancy. After easily changing the heads up display colour from orange to green, I’m away. Driving past some expensive looking houses, I feel as though I should be wearing one of those chauffeur hats while a celebrity enjoys the vast rear legroom behind me. Hyundai have kept the dash as clean as possible, so there aren’t a lot of buttons cluttering up the space. The analogue clock seems a bit dated and borderline cheesy, but I actually grow to like it. I set the satellite navigation for Shepparton and obligingly follow instructions that send me over Melbourne’s Westgate Bridge. Twice. The system attempts to play the game a third time before I turn it off and go it alone. 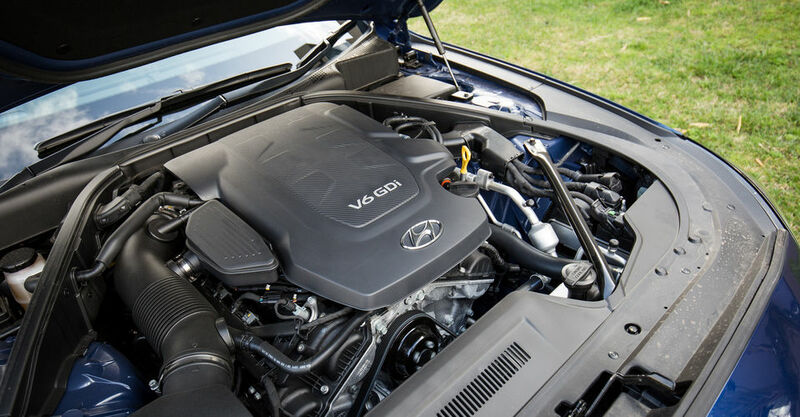 Teaming a quiet yet punchy 232kW/397Nm 3.8-litre V6 petrol engine with an eight-speed automatic transmission, the Genesis sits at around 1700rpm at 100km/h, with average fuel consumption nestled at or near the car’s 11.2 litres per 100km claim. Not terrible for 1995kg of large car but not great. It also becomes rather thirsty when doing around town errands, with numbers climbing to 15.7L/100km. Highway cruising in the Genesis is such a pleasure that I don’t want to stop for a break between Melbourne and Shepparton. Electrically heated and ventilated, the tan-coloured ‘premium’ leather-appointed seats feel like your sitting in a lounge suite. Road noise is minimal enough that I check several times to ensure the engine is actually still on, and the motor-driven electric power steering is light and precise both at low and high speeds. The big Hyundai also has a handy adaptive cruise control function. This means any braking you’d normally do as you approach a slower vehicle, is all done for you by the car. You can even set the ideal distance of your choosing – with three distances to choose from. The Genesis’ long list of impressive equipment continues with a panoramic sunroof; electric rear sunshade; auto dimming mirrors; ‘smart boot’ and 17-speaker Lexicon sound system. Only really noticeable at night, I particularly like the Genesis’ wing mirror-mounted puddle lamps that project the model’s logo onto the ground when locking the car – Nice. Those riding in the rear get treated too, with an Audi A8/S8-style centre armrest that folds down to reveal a control hub that allows backseat occupants to fiddle with the stereo and front passenger’s seat. I don’t like the idea of others being in charge of the music when I’m driving though, so it’s excellent that Hyundai’s included an option to ‘lockout’ the rear controls. Comfort and technology are all well and good but did you know that late last year, the Hyundai Genesis – with its nine airbags, autonomous emergency braking (AEB) capability and five-star ANCAP safety rating – broke 21 years of Australian safety records? It’s true. Back in October, 2014, the car excelled in the local safety body’s testing regime with a total score of 36.88 out of a possible 37 – the highest ever recorded by ANCAP. Genesis means ‘beginning’, and the new model certainly resembles the start of an exciting time for Hyundai Australia.